After the start of the Second World War on 3 September 1939 a period described as the Phoney War began. This lasted until the Germans launched their attack into Belgium, The Netherlands & Luxembourg in May 1940. The attack ultimately led to the Fall Of France and the ensuing Battle Of Britain. During the Phoney War a number of actions took place where Luftwaffe and Royal Air Force aircraft met in the skies over or near Britain. 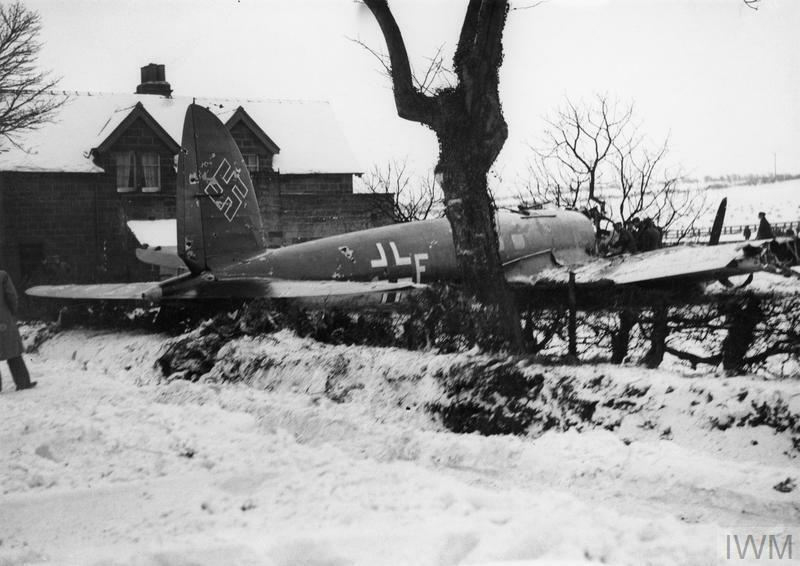 One such action resulted in a Heinkel He-111H3 medium bomber of 4/KG26, 1H+FM w/nr.2323, being the first enemy aircraft to be shot down on English soil by RAF fighters. On 3 February 1940 a number a Luftwaffe bombers took off in the early morning to attack shipping off the North East coast of Britain. Just after 9am a contact was detected by Danby Beacon Chain Home radar station flying 60 miles off the coast. Hawker Hurricane fighters from No 43 Squadron based at RAF Acklington were scrambled and intercepted the contact which turned out to be a Heinkel, shortly after it had attacked an unarmed trawler. Opening the attack on the Heinkel was F/Lt Peter Townsend (L2116) who was leading Blue Section with F/O Patrick "Tiger" Folkes (L1723) and Sgt Jim Hallowes (L1847) following in his wake. Townsend's opening burst of fire damaged the Heinkel's starboard engine and fatally wounded the bomber's Observer Unteroffizier Rudolf Leushake. Folkes followed next with his fire inflicting further damage to the Heinkel and wounding Mechanic/Ventral Gunner Unteroffizier Johann Meyer, who later died from his injuries. Further attacks followed in which Unteroffizier Karl Missy, the aircraft's Wireless Officer/ Dorsal Gunner, was wounded in the leg, which was later amputated. With the bomber now in a very perilous state the pilot, Feldwebel Hermann Wilms, had little choice but to turn in land over Whitby, in an attempt to find a suitable landing place. The bomber headed low over the fishing town and came down in a snow covered field very close to Bannial Flat Farm. "I felt elated as I watched the enemy bomber crash. Then the full implication struck me. Someone heard me murmur, as I climbed out of the cockpit. "Poor devils I don't think they're all dead". Two of them were. Remorse rather than curiosity impelled me to visit the survivors in hospital. One of them, Karl Missy, the rear gunner had tried to kill me; he was prevented when the bullets from my guns sawed through his leg and felled him. Despite the harm I had done him, he clasped my hand, but in his steady brown eyes, was the reproachful look of a wounded animal"
Townsend again met Missy in his home in West Germany in 1969 and the two remained friends until the German's death in 1981. Such an event was sure to attract a crowd and before long people gathered at the crash site. Tempers were running high at the time against the Luftwaffe after a number of attacks against shipping off the North East Coast. The two dead crew members were removed from the crash site and placed out of sight in a cottage outhouse. The two survivors were taken and held in the farmhouse until their removal to hospital. The two Luftwaffe crew members who died are buried in the Cannock Chase Cemetery in Staffordshire. ​Of the three RAF fighter pilots two were to survive the war with one being lost shortly after the action described above. Peter Townsend retired from the RAF in 1956 as a Group Captain. He is most widely known for his romantic links to HRH Princess Margaret. He died in France in 1995. Herbert James Lempriere Hallowes went onto fight in the Battle Of France and Britain and continued through the war with a score of nineteen aircraft destroyed and others damaged. He was promoted to Acting Wing Commander in March 1944 and became Station Commander at Dunsfold. He retired from the RAF in July 1956 with the rank of Squadron Leader, retaining the rank of Wing Commander. He died in October 1987. Patrick Folkes was lost whilst flying with No 43 Squadron when his Hurricane crashed into the sea off Wick on 16th April 1940. He is commemorated on the Runnymede Memorial. 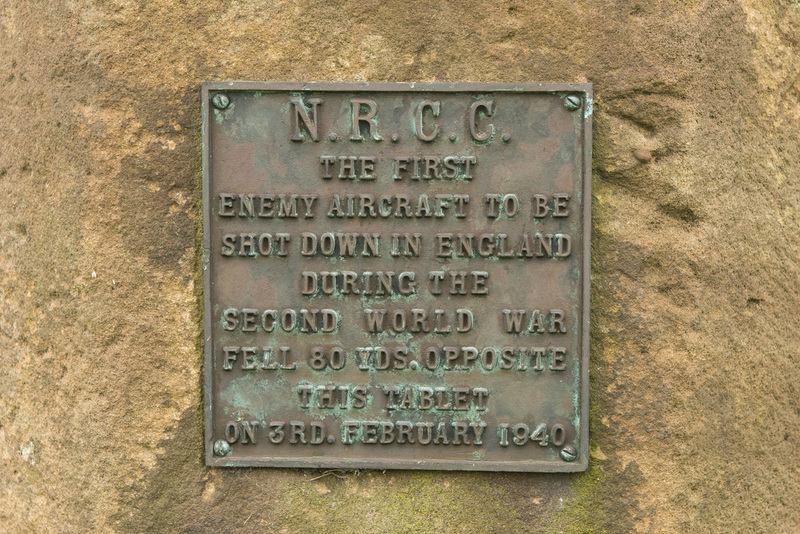 As the shooting down of the Heinkel was a significant event, North Riding County Council erected a memorial in the early 1950s close to where the bomber crash landed. 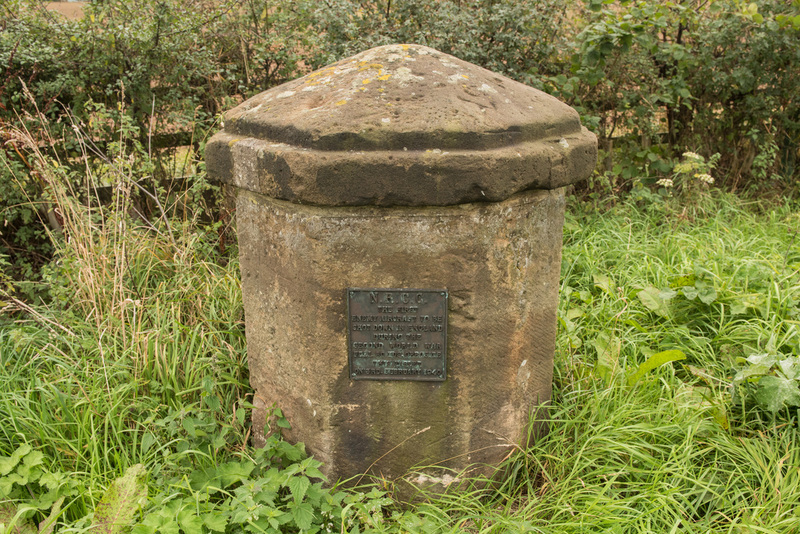 The memorial is located near to the junction of the A169 and A171 roads.